Found 3 file extension associations related to ProntoGERBER-CONNECTION and 1 file format developed specifically for use with ProntoGERBER-CONNECTION. 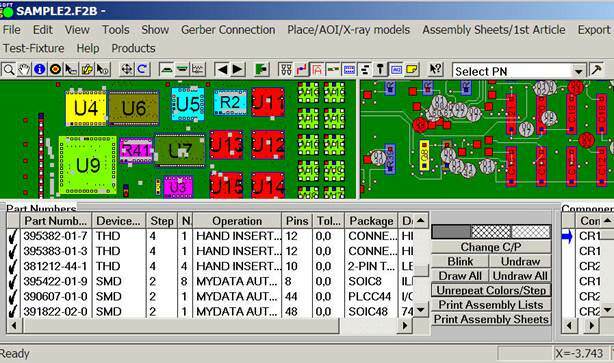 ProntoGERBER-CONNECTION software imports raw Gerber data and allows the user to add intelligent information to the shapes on the display and create process assembly sheets. ProntoGERBER CONNECTION software translates Gerber and Bill of Materials (BOM) files into real reference designators, theta rotation, part numbers, X/Y component pin geometries, values, tolerances, etc. This data is then used by Process Engineers or Test Engineers to program their SMT, Thru-hole Automatic Assembly Equipment, AOI and Test Equipment. ProntoGERBER-CONNECTION also creates process sheets for assembly aids and to document your assembly process. Instantly receive a report containing device and package type counts with quotation and cost estimations. If you need more information please contact the developers of ProntoGERBER-CONNECTION (UniSoft), or check out their product website.